As 2009 fast approaches, I just wanted to say thanks once again for letting me do this as I head into my 13th year next month. It's been quite a busy year for me, and I hope all the changes and additions were well received. I've got two very cool interviews on the go and I hope you guys can get to read them soon. We've got some things coming up in 2009... namely Daredevil "500", Daredevil: Noir and maybe even Daredevil: End of Days. Lady Bullseye's first arc will be collected, and the Brubaker/Lark omnibus will also ship. 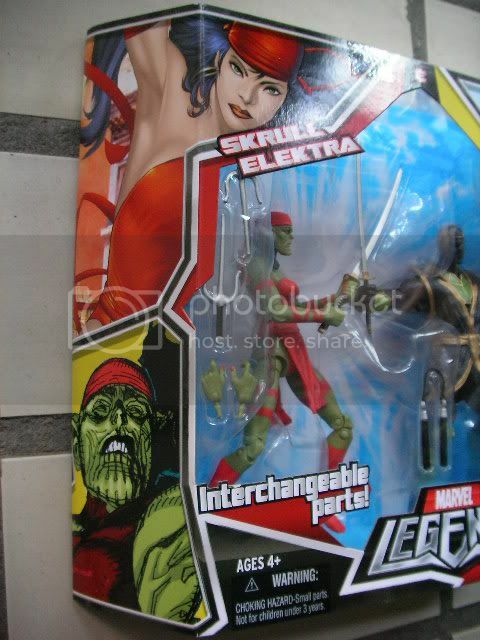 Elektra returns in Dark Reign: Elektra, illustrated by Clay Mann. Randy Bowen has some cool DD mini-busts coming out. Lots of things going on, and I hope Marvel does something cool for issue #500 in the summer. IGN has some cover and info for some Dark Reign series that will debut in 2009... and there is a limited series for Elektra coming out by writer Zeb Wells and artist Clay Mann. Amazon.ca has a listing for "Daredevil By Ed Brubaker & Michael Lark Omnibus Volume 1 HC". It's listed as 624 pages and will arrive in June 2009. It will collect Daredevil #82-105. Back in the 90's, Marvel had experimented with a line of "CyberComics", a precursor to today's digital comics. 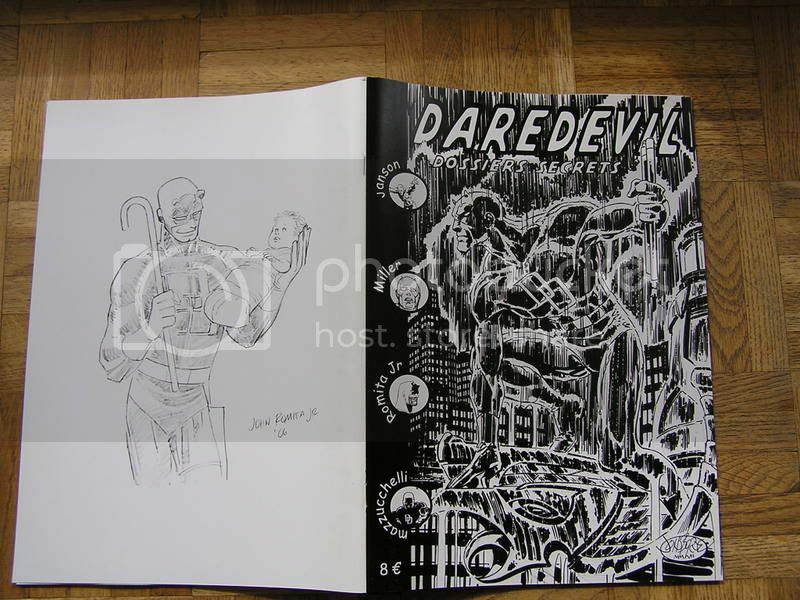 One CyberComic was Daredevil: Protection Racket, by former Daredevil writer Dan Chichester. It hasn't been online in a long time, but now you can view it on Chichester's blog. Head on over to this link, and click on the "Daredevil" graphic. Part 1 is now up, and the remaining 3 parts will be posted this month. 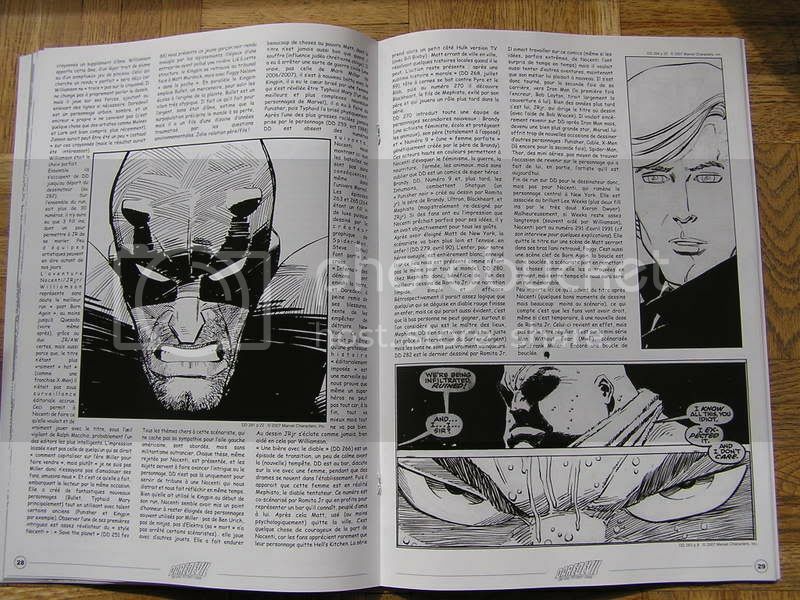 If you ordered the Daredevil: Yellow Premiere Hardcover (the Black and White version) you're out of luck. All orders for this version have been cancelled. The regular edition has been bumped up to 168 pages from 160. * Fingers crossed that the site is not bogged down or unavailable like yesterday. My apologies for that. My hosting company is looking into this problem. * Follow the site on Twitter. * The Twitter RSS feed is here. * The site is also on Facebook. Newsarama has an exclusive preview of next week's Daredevil #113... spoilers ahead! The Elektra: The Hand and the Devil fan film is now complete and you can watch the finished product right here! The fan film is produced by Blinky Productions' Chris .R. Notarile and stars Kim Santiago as Elektra. When you're done watching, head on over to Blinky Productions' web site and have a look at other fan films that may be of interest. The Cartoon Art Museum is honored to celebrate the life and work of cartoonist Gene Colan with a career-spanning retrospective entitled Colan: Visions of a Man without Fear. This exhibition will include over 40 examples from Colan's long creative career, from his one and only story illustrated for legendary publisher EC Comics in 1952, through his career-defining work for Marvel Comics from the 1960s and 1970s on titles as diverse as Iron Man, Tomb of Dracula and Howard The Duck, to his notable run on DC Comics. Batman in the 1980s, to his more recent efforts, including illustrations commissioned by his fans and his beautiful pencil artwork on titles such as Michael Chabon's The Escapist, published by Dark Horse Comics. This exhibition has been assembled by Guest Curator Glen David Gold, author of the novel Carter Beats the Devil and many comics-related essays. An exhibition catalog featuring high-quality reproductions of Colan's artwork and essays from many of his most notable collaborators, including writers Stan Lee, Marv Wolfman, Roy Thomas and Steve Englehart, will be available at the Cartoon Art Museum prior to the exhibition.s opening reception on December 4, 2008. Gene Colan and his wife Adrienne will be the guests of honor at the December 4 reception, and many Bay Area comic book professionals are scheduled to be in attendance. Additional information regarding this reception will be announced later this month. One of mainstream comics' most significant artists, Gene Colan was born in New York in 1926 and studied at the Art Students League of New York under illustrator Frank Riley and surrealistic Japanese painter Kuniashi. After a stint in the army, Colan's official career in comics began in 1944 at Fiction House and Timely. He has worked over the last 60 + years at almost every major publisher, including EC, Marvel, DC, Dark Horse, Bongo and Archie. His most memorable work includes unsurpassed runs on Daredevil, Iron Man, Sub-Mariner, Captain America, Captain Marvel, Dr. Strange, Tomb of Dracula and Howard the Duck, not to mention inspired depictions of Conan, Batman, Superman and Wonder Woman. Beginning in the 1980s, Gene took on more varied and unusual work, including Nathaniel Dusk, Ragamuffins, The Spider (a graphic novel), Stewart the Rat, and Michael Chabon's The Escapist. Colan has taught at both the School of Visual Arts in Manhattan and the Fashion Institute of Technology. He has enjoyed showings at the Southern Vermont Museum of Art, the Bess Cutler Gallery in New York City and Manchester's Elm Street Arts Gallery where he lectured on Comics, Cinema, and Continuity Art. Colan is the recipient of a Shazam Award, two Eagle awards and in 2005 was inducted into the Will Eisner Hall of Fame. His style is immediately recognizable for its dramatic & sweeping cinematic form, mastery of light and shadow, expression and characterization, and unusual eye-catching layouts. Colan is also responsible for the innovative use of "finished pencils" as artwork. 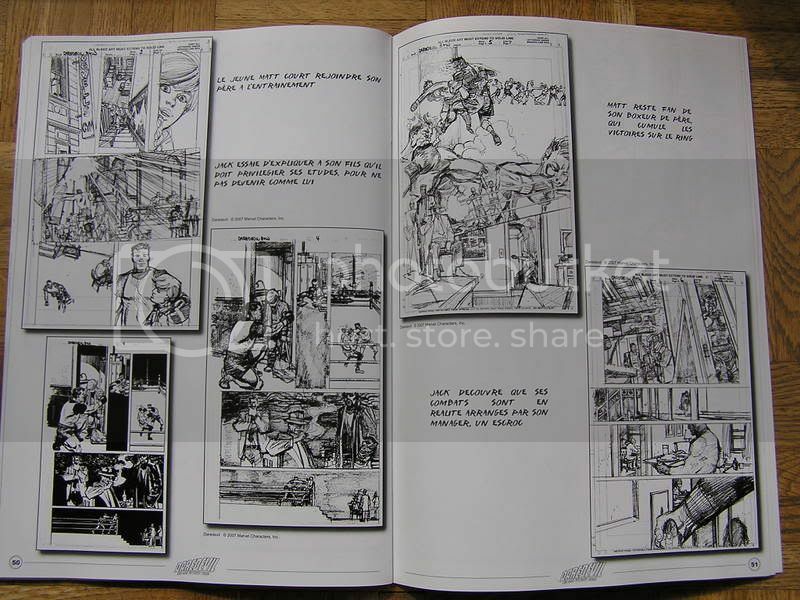 He's the only mainstream comic book artist today whose work is usually published directly from his pencil illustrations. I'm sure I've mentioned the RiffTrax for the Daredevil movie before, but Christopher Anson from Legend Films/RiffTrax wrote in, detailing more about their work. Check them out if you were a fan of MST3K. RiffTrax is the internet continuation of the cult-hit TV show Mystery Science Theater 3000. At the end of the show's television run, star Mike Nelson and his comedic cohorts (Satellite of Love partners Tom Servo and Crow T. Robot) reunited to "riff" (comedic commentary made during a film) the latest and greatest Hollywood blockbusters, including the many Marvel movies. This is accomplished through the release of MP3 tracks (the RiffTrax) that synchronize with the playback of a given film to reproduce the MST3K experience. We've also developed a free software player that makes synchronization effortless. True to MST3K form, these riffs add both hilarity and yet-another reason to bust out your DVDs. It's a bit hard to explain, so we suggest just trying it out. Of course, for those unfamiliar with Mystery Science Theater 3000, there are sample videos available for each RiffTrax release. Just click the "Watch Sample" button on the film's page to try it out. We assure you, no blind lawyers were harmed in the making of this riff. We have a lot of fun making these, and we hope that you guys will enjoy them too. Daredevil Noir writer Alex Irvine contacted me to let me know that he's posted several pages from the series on his blog. It also appears that the series will now debut in April, rather than January as first reported. If you're in New York City, you might be interested in attending November 11th's Comic Book Club show at the People's Improv Theater at 8PM. That night's guests will be Brian Michael Bendis, Ed Brubaker, Matt Fraction and Jeff Katz. 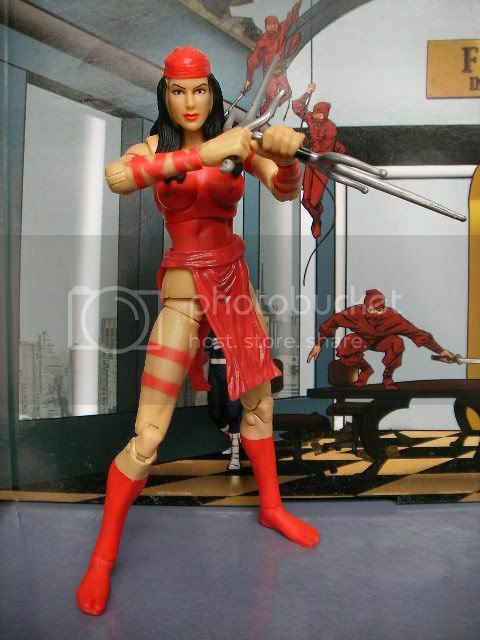 Currently in production is a new Elektra/Daredevil fan film entitled: "Elektra: The Hand and The Devil". It is by Blinky Productions, which is run by Chris .R. Notarile. I got in touch with him recently, and he sent me some images and the teaser trailer. Shooting is scheduled to wrap next week and Chris will let me know once the final product is complete. 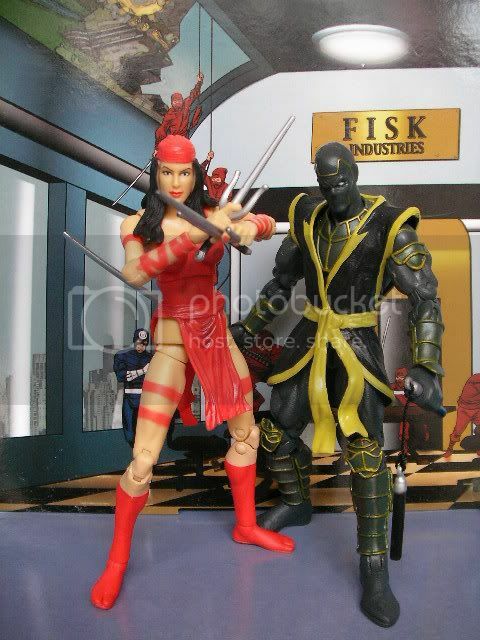 Kim Santiago stars as Elektra, Adam Shorsten as Daredevil and Damien Colletti as Bullseye. For all the Canadians out there who haven't been to the comic shop this past week... the price of the average Marvel comic has gone back up to $3.50, up from $3.05. Newsarama has an exclusive first look at Daredevil #112 with an 8 page preview (with dialogue). SPOILERS AHEAD! Marvel.com has a little feature on DD#112, along with some info courtesy of writer Ed Brubaker... only read this article if you've read DD#111! Congratulations to Daredevil letterer supreme Chris Eliopoulos, who won for Best Letterer at this year's Harvey Awards! CBR continues their FROM THE EDITOR'S DESK feature, and this time they speak with former Daredevil editor Ralph Macchio. He discusses his work on DD, and working with Miller and Sienkiewicz. The first issue of the Lady Bullseye arc comes out today. 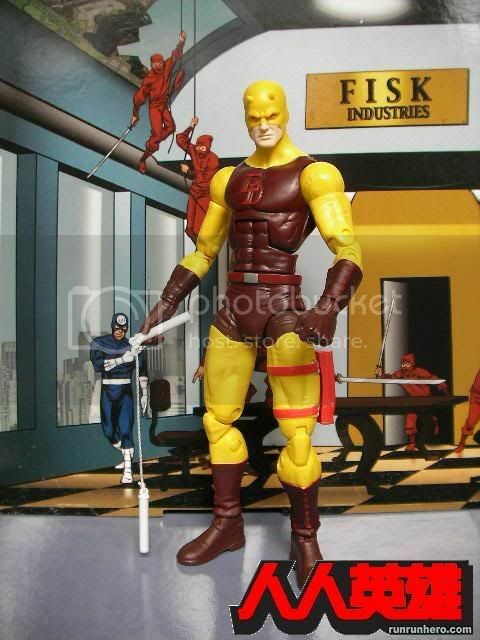 Just in case you've missed it, here are some items of interest pertaining to this latest story in Daredevil. Matt Moerdock possesses strength, speed, agility, and endurance, not to mention acrobatic and gymnastic skills. Through a combination of the tutelage of his brother Martin (kung Fu Master) and self-training, Matt Moerdock is a master of a unique martial art form, which is a hybridized form of American rhyme skills and the French arts of poetry. This sort of martial arts rhyme training has given him an immense degree of concentration and personal control over his body and energy, or Ki. Matt Moerdock is also an accomplished journalist well known in France's HipHop world. Here's a sample of Matt Moerdock's "Dance With The Devil"
Marvel.com has a new video posted, with writer Ed Brubaker describing what this week's issue is all about! CBR has a new interview with Ed Brubaker, where the DD writer talks about the Lady Bullseye arc and lots more! Meet the artist behind the debut issue of Lady Bullseye! Longtime friend of the site, Alice Woodside Lynch (aka Darediva) has asked me to post information on a worthy cause she is involved with. If you're interested, help support her efforts! Help Team Darediva for a worthy cause! I recently accepted the challenge of participating in VISIONWALK, a big step in boosting research for retinal degenerative diseases, hosted by The Foundation Fighting Blindness, in Memphis, Tennessee, on October 18, 2008. In case you didn't know, I have macular degeneration, a retinal disease that eventually can greatly impair vision. The research donations I'm asking for may not help me in my lifetime, but they can go a long way toward fighting for a cure for generations to come. I am asking you to help by supporting my fund-raising efforts with a donation. Your tax-deductible gift will make a difference in the lives of many! It is faster and easier than ever to support this great cause - you can make your donation online by simply clicking on the link at the bottom of this message. If you would prefer, you can also send your tax-deductible contribution to the address listed below. In addition, anyone contributing $25 or more directly to Team Darediva will receive a Team Darediva t-shirt. This will not affect the tax-deductible status of your gift, because I will be footing the cost of the shirts myself. It's my thank you gift directly from me to you. Just tell me what size shirt you would like, and after I receive confirmation of your donation from the VisionWalk folks, I'll ship you the shirt. IGN has posted more previews of DD#111 (the first Lady Bullseye issue), this time with text and more pages that haven't been seen previously. SPOILERS! Further to an item I posted on August 14th, the Marvel Apes #1 variant of "Daregorilla" by the late Mike Wieringo, is now available for purchase. It is limited to 3000 copies and is $8.00 US. The studio is even considering reviving the "Daredevil" property. As mentioned here on the board by Dave Wallace, it appears Marvel has made some rather interesting errors with the omnibus that shipped this week. The omnibus collects issues #16-19, 26-50, 56-60 of the work by Brian Michael Bendis, Alex Maleev and David Mack. Only Bendis's name appears on the cover. Alex Maleev really deserves to have his name associated with this run, don't you think? It's the Bendis/Maleev run on DD! Also, right on Daredevil's nose is a copyright symbol! Bendis has posted on his board that Marvel will be taking steps to correct the error. Once I find out that info, I will update here. Marvel has posted a free digital comic version of the Daredevil Saga promo that I mentioned on the 17th... catch up on everything from #82 to #105, along with a sneak peek of DD#111! UPDATE: Full solicits now up in PREVIEWS. Matt comes face to face with one of the deadliest and most alarming new characters he.s ever encountered--Lady Bullseye! Plus...who is the mysterious old man at the center of the in-fighting within the Hand...and how is he linked to Matt Murdock's past? It's Part 3 of "Lady Bullseye," by the award-winning creative team of Ed Brubaker and Michael Lark!! More details tomorrow at 12PM EDT. Marvel has released a special promo one-shot, ahead of the Lady Bullseye arc, to get readers up to speed on what has happened in Daredevil since Ed Brubaker took over the writing from Brian Michael Bendis. There's a re-cap of what has happened from #82-105, using panels from the comics. There is also a small preview of DD#111. The promo should be free at your local comic shop. 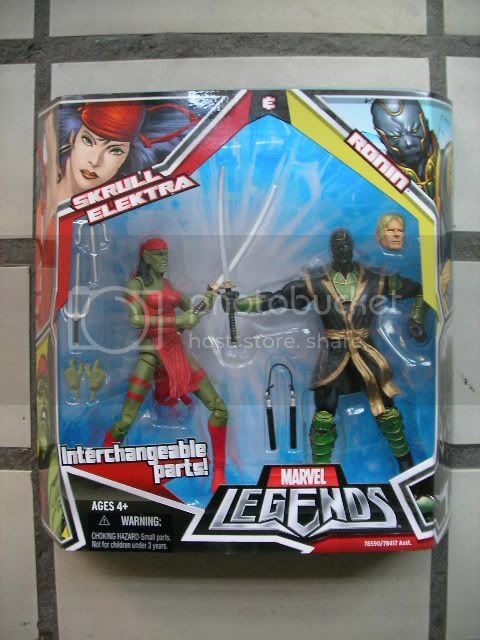 Marvel sometimes releases these promos on their web site too, so I'll keep an eye out for that. The Hero Inititative will have their own special variant cover for Marvel Apes #1 by the late Mike Wieringo. On Marvel editor Tom Brevoort's blog, he has posted the cover, which features 'Daregorilla' (my guess at what "DG" stands for). All proceeds from the book go to support past and present comic creators. Marvel.com has an article/interview with Ed Brubaker and Greg Rucka on what DD fans can expect in the finale to "Cruel and Unusual", along with some background on what makes Dakota North tick. 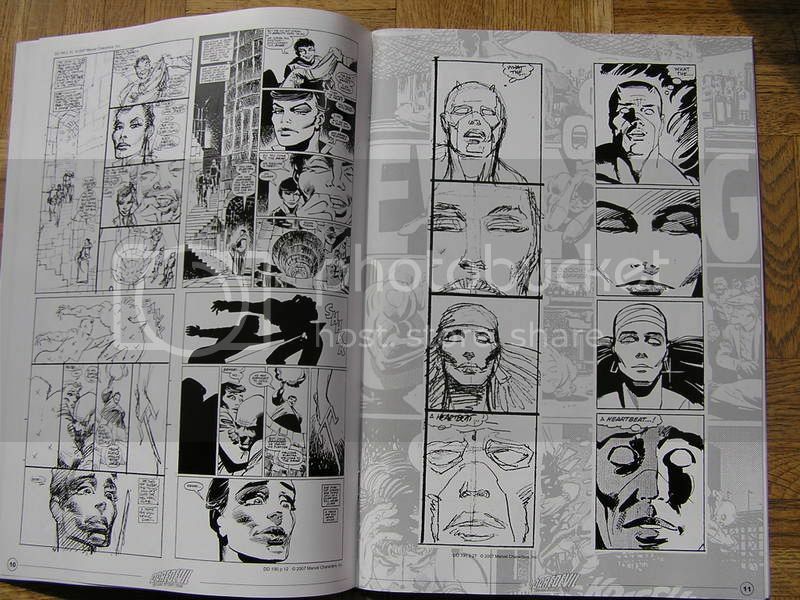 There are also 4 preview pages of DD#110 available to view. The director's cut of the Daredevil movie will be available on Blu-Ray disc at the end of September. It appears the extras will be a combination of what was available on the first release on DVD and the director's cut. A selling point on the cover is "Starring Jon Favreau, director of Iron Man as Foggy Nelson". One of the articles I mentioned on 31/07 - [Wizard #203] is now available online... it's the shorter of the two articles, where Quesada/Palmiotti talk about Marvel Knights. The other article where Q/P/Smith comment on Guardian Devil is not online (yet?). 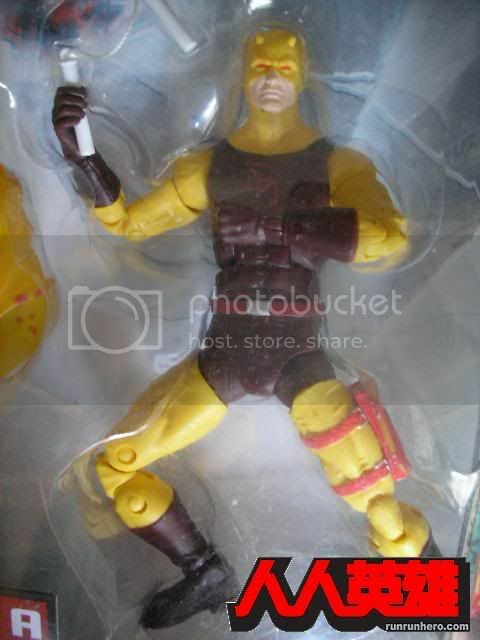 Remember when Vin Diesel and Cuba Gooding, Jr. wanted to play Daredevil as well? :) Statham I can see as Bullseye... DD... don't think so. Randy Bowen has posted images of a fully-painted Bullseye statue he is currently developing... check it out! Now I know some of you think that the title sounds like I'm talking about how well the DD movie did, but I'm really talking about a new mini bust that was unveiled at the Comic-Con... also some Marvel Universe DD and Bullseye figures were also displayed... Thanks to Jamie for the links! Congratulations to Ed Brubaker for repeating as Best Writer at the 2008 Eisner Awards! Solicits for October are now up... DD#112 will have two covers (unfortunately, there isn't a preview of the "Zombie Variant" cover available). The Cruel and Unusual storyline will be collected in October as well. The Elektra Omnibus has also been pushed back to October. In other news, the faux bronze statue shipping December is completely sold out through Bowen Designs. The second of Hero's Gene Colan prints will be available first at Wizard World Chicago, this one featuring the cover art to Daredevil #47, the legendary "Brother, Take My Hand" story by Stan Lee and Gene Colan. Only 200 prints will be available at the show at a cost of $25 each. Net proceeds from sales of these prints by the Hero Initiative will benefit Gene Colan. And Iron fans take notice: A heretofore unannounced special variant cover edition of the smash-hit Invincible Iron Man #1 will also be at the Hero Initiative booth. Colorist Stephane Peru unfortunately passed away while working on Invincible Iron Man #1, and Marvel Comics has created a mere 100 copies with the notation "In Memoriam, Stephane Peru, 1981-2008" on the cover. All 100 copies have been autographed by writer Matt Fraction and artist Salvador Larroca, and will be available for sale by The Hero Initiative. EW.com has an exclusive first look at Marvel Apes variant covers, and guess who has his own variant cover for issue #110? Brian Michael Bendis and Alex Maleev will discuss their five-year run that turned Daredevil into one of the most successful comics in Marvel history. Is anyone going that can file a report for us? DD fan Ian Austin wrote in, pointing me towards a Daredevil Virtual Series he is writing at Monster Zero Productions. A Virtual TV show is an episodic television show that airs, not over the airwaves, but over the Internet. VTV is usually written in script format (the same format that actual TV shows are written in) and posted as PDFs or HTML. It exists as an online series of scripts that work as a 'real' TV show would. A virtual series will typically have a 13 or 22 episode season, each 'episode' being a script that represents a 30 or 45 minute episode of the show itself. Virtual series can still have 'cast,' by using images of actors to play the roles on the show, and we encourage people to use other multimedia elements to enhance their show, like opening video credit sequences and sound files. The Harvey Awards nominations are out and Daredevil is well represented... check this out! Now, who do I talk to about the missing Micheal Lark from these nominations? The previews for September are now up, and lots of great things coming out that are DD-related. There will be a special Gene Colan Tribute issue, which will have reprints of Colan classics. The issue will help support The Hero Initiative, and thus, help Colan with his recent health problems. September 2008 is also the 10th anniversary of Marvel Knights, and there will be a special Premiere edition of Guardian Devil (two covers), and also a Marvel Spotlight (two covers as well) which will have interviews and sketchbook art from Joe Quesada, Jimmy Palmiotti and others. Thanks to MattTheDevilMurdock1202, who pointed me to the Bowen Designs web site, where they have posted images of a new Faux Bronze DD Statue, coming in December 2008. It is based on the original DD Statue Bowen designed years ago. $300 US. 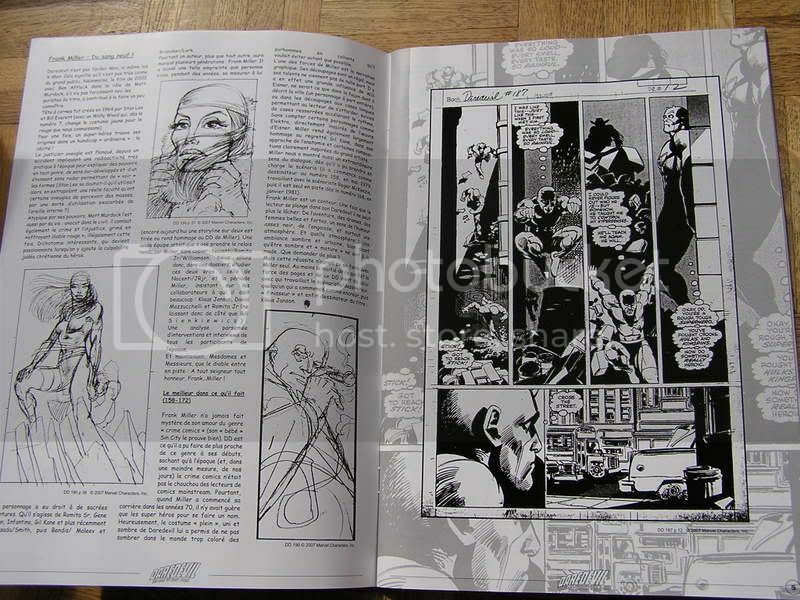 The Gene Colan auction has begun... help support the legendary DD artist by bidding on lots of cool items! 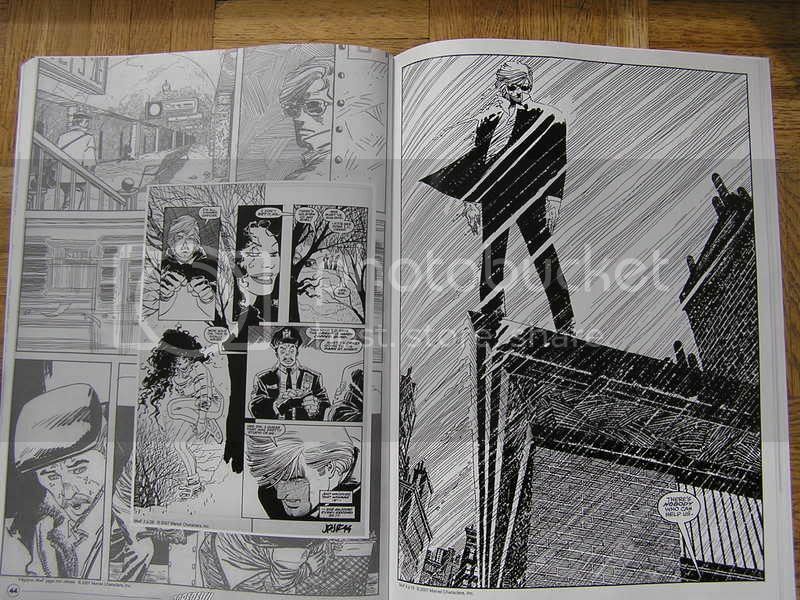 MyCupO'Joe has some preview pages of the still in progress Daredevil: End of Days, by Klaus Janson and Bill Sienkiewicz. As I'm sure you know, Gene Colan is very ill right now. There are many people organizing auctions etc. to help support him. Neal Adams, Norm Breyfogle, Randy Bowen, Ed Brubaker, Adam-Troy Castro, Paty Cockrum, Peter David, Tom DeFalco, J.M. deMatteis, Pat DiNizio, Harlan Ellison, Mark Evanier, Neil Gaiman, Sam Keith, Joe Kubert, Erik Larsen, Bob Layton, Jim Lee, Stan Lee, Leah Moore, Albert Moy, Michael Netzer, Josh Olsen, Tom Palmer, Mike Pascale, Bob Shreck, Dave Simmons, Gail Simone, Walter and Louise Simonson, Jim Starlin, Juan Torres, Marv Wolfman and Ash Wood. NT ComicCon, Harris Publishing, IDW Publishing and Aardwolf Publishing have also stepped up. Want to help right this minute? Order Meth, Colan & Other Theologians -- the full proceeds will go directly and immediately to Gene. Please do what you can, either by sending appreciative messages to Mr. Colan, or by bidding on the auctions when they are ready. The Pulse has another interview with Chris Samnee about Blood of the Tarantula. There's some original black and white, and then coloured images from the special. Thanks to jumonji, who pointed me back to Top Cow's site, where they've posted that the Magdalena/Daredevil one-shot is now scheduled for May 28. Marvel.com has posted an article on past trials that Matt Murdock has defended, and what is coming up in DD#107 as 7 pages of preview art is presented! * DD: Blood of the Tarantula's Chris Samnee was interviewed last week... be sure to check it out! * If you're interested, why not check out the ManWithoutFear.com page on Facebook and "become a fan". * If you've never visited the BOARD, visit and discuss all your favourite DD topics with fans all over the world... we're closing in on 500 registered members! If any of you are subscribers to Marvel's Digital Comics, they've added quite a few DD issues in the latest batch... Daredevil V1 #12-40 and Daredevil: Redemption #4-6. DD: Blood of the Tarantula writer Ande Parks was interviewed by his frequent collaborator Phil Hester, at the Wizard site, where they talk about the special and more! I've posted a new interview with Daredevil: Blood of the Tarantula artist Chris Samnee. Hope you guys enjoy some of the character sketches he provided! As many of you have noticed, the past few weeks have been hit or miss when trying to access the site. I've been told by my hosting company that the site will be moving to a new server in the coming weeks and everything should be fine after that. I thank you for your patience. 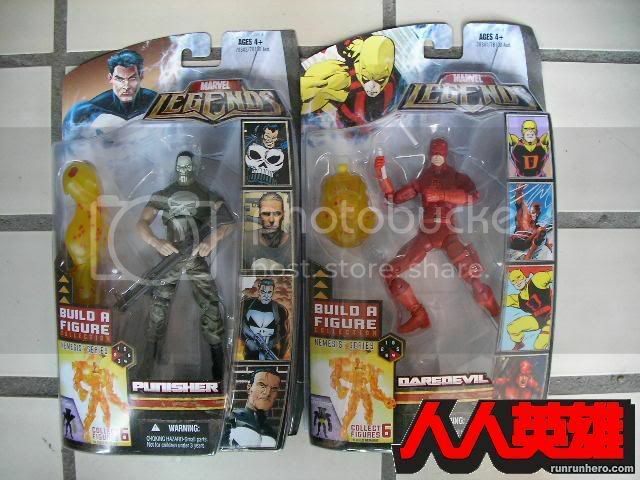 Magdalena/Daredevil should be in stores by the end of the month. We ran into some unfortunate delays but Phil and Ande are wrapping it up currently. Full solicits are now up on the site! Check out previews for DD#109, Mighty Avengers #16, and Amazing Spider-Man #565, 566! The Eisner nominations are out, and a couple are DD-related! Former DD artist Alex Maleev will be appearing at this weekend's Toronto Comicon. If you've got a coupon from a comic store in the area, you can get in free on Sunday. If you live in the New York City area, be sure to head down to Jim Hanley's Universe on Monday April 14, from 6-8PM, when Brian Michael Bendis, Ed Brubaker, Jeph Loeb, Matt Fraction and Jen Grunwald will all be there. * When asked what 5 characters to keep our eye on for the rest of the year, he mentioned "Daredevil", along with "Nick Fury, Norman Osborn, Iron Man and Kinsey"
* When asked if there are plans for the Santerians from DD: Father, he said "I have a follow-up story that I do plan to get to, I just don't know when that will actually be. There's a very detailed origin I have for NeRo and the group that I'd love to tell some day, so we'll see." Twomorrows Publishing magazine BACK ISSUE had an issue last year (issue 21) featuring DD as done by Miller/ Janson/ Mazzucchelli/ Nocenti/ Romita Jr. I wrote the article about our beloved Matt. A small part of whatever rare or unpublished stuff I may have was published in issue 21 of BI. 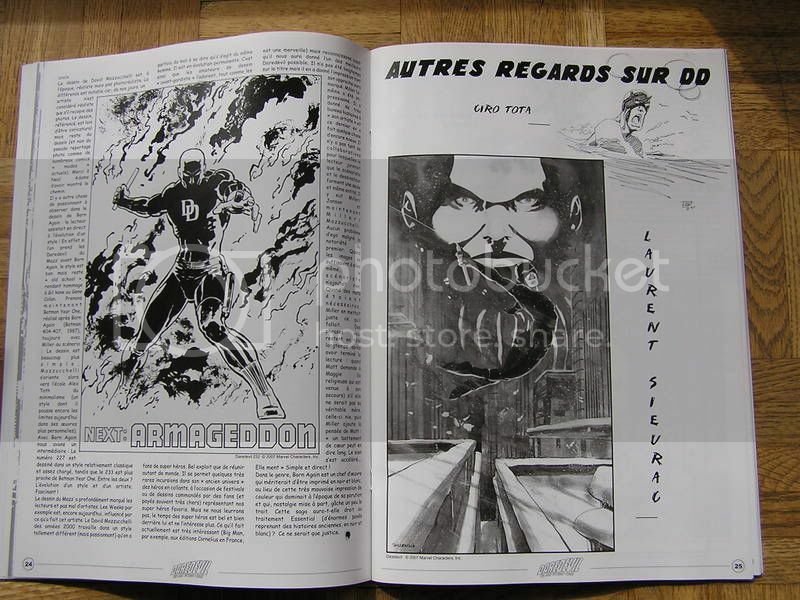 I was asked (by friends) to make some kind of a french version of Back Issue's article + more. And so I did. 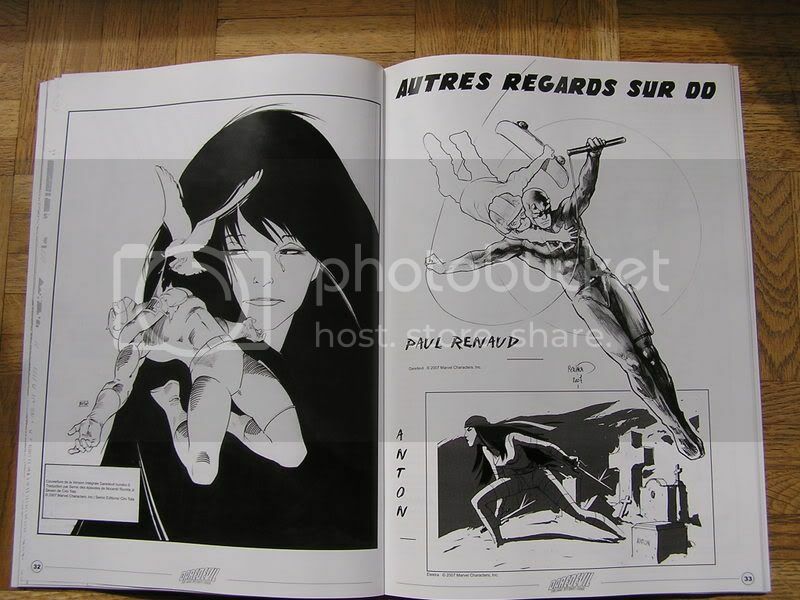 At the end of last year this French mag was out. Very small printing run: 400 issues (numbered) 52 pages Magazine sized, very good paper, black and white. 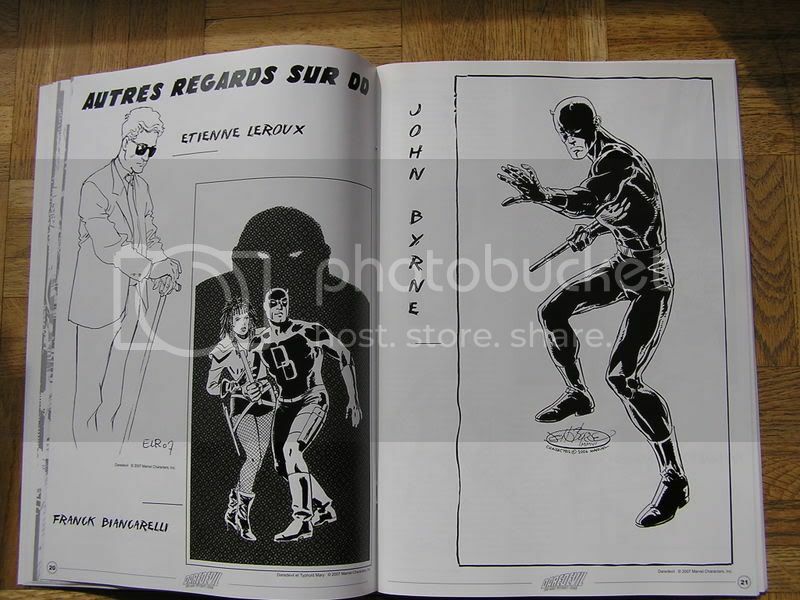 + this french mag has so much more than the US article : A lot of french artists drew me a DD pin up (+ pieces by Byrne, Sean Phillips and the late Mike Wieringo). If you send me the money via paypal, and give information for the shipping address, the mag will be on its way to your home the same week. Marvel.com has another DD feature, asking several past and present DD creators what they feel are the best DD stories! Marvel.com has an article about DD's past and present romances, along with a preview of this month's DD#106, coming March 26! Thanks to jumonji for the link to an interview with Daredevil cover artist Marko Djurdjevic, at the IGN site... check out page 3! Newsarama has a preview of New Avengers #39, which features artwork by David Mack. Daredevil makes an appearance in this Echo story. Marvel.com has an interview with Greg Rucka, where they discuss the upcoming DD arc! Former Daredevil writer, and Howard the Duck creator, Steve Gerber, has sadly passed away. I had the good fortune to correspond with Mr. Gerber for the site, and he has always been one of the nicest people I've ever interviewed. Go dig out those old DD issues. Go dig out those Howard the Duck magazines. Looks like another Daredevil Special is coming... coming in April is the Daredevil: Blood of the Tarantula special, where Ed Brubaker, Ande Parks and Chris Samnee continue the story begun in the Daredevil Annual. Look for more info tomorrow! Thanks to a number of you who e-mailed me today about a listing on Amazon for a new Bendis/Maleev DD Omnibus... whether or not this is the final description is up in the air, however, since it says it contains 16-19, 26-60. My guess it would be until #50. Seems I've been so busy, I completely forgot January 16th has past! The site is now 12 years old, and I just wanted to thank all of you once again for letting me do this. In case you don't know, I started a blog detailing some of the things that have happened over the past 12 years because of this site. Have a look if you're interested! Listeners of the Bendis Tapes Part 1 posted on Jinxworld learned the Daredevil: End of Days project is still a go, but does not have a release date as both David Mack and Klaus Janson have other higher profile work that has just come up that is keeping them busy. Bendis says the project has been relegated to "weekends" or whenever there is free time. 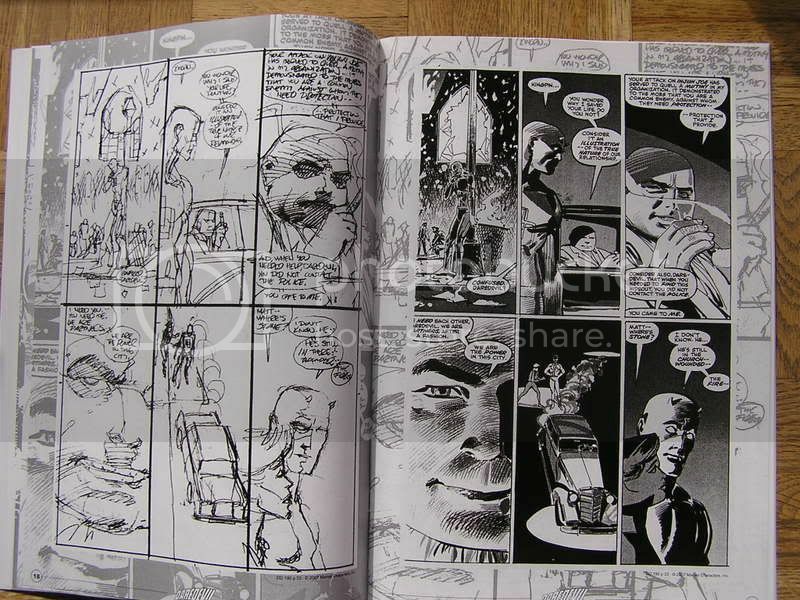 Also, there was no status update on the rumoured Daredevil omnibus of the Bendis/Maleev run in black/white/red.